The UK Government established a laboratory at King Edward Point. South Georgia in 1924–25 as part of the Discovery Expedition. Discovery House was built and initially used for accommodation, and later as a store and workshop. In 1950, the Falkland Islands Dependencies Survey took over ownership of the station. BAS operated the station from 1969 until the outbreak of the South Atlantic Conflict when the island was invaded by Argentine troops on 3 April 1982. Thirteen BAS staff present at the station were forcibly removed to the Argentine ship Bahia Paraiso. A further nine BAS scientists and two photographers from Anglia TV were undertaking fieldwork at the time of the invasion and remained at various field huts on the island until it was liberated on 25 April 1982. 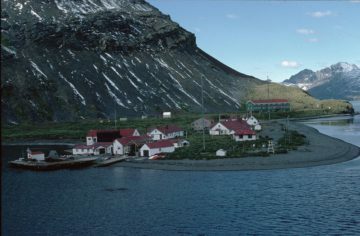 A British Military garrison occupied King Edward Point from then until 2001. On 22 March 2001, the Commissioner for the Government of South Georgia and the South Sandwich Islands (GSGSSI) opened the new applied fisheries research station at King Edward Point, South Georgia. 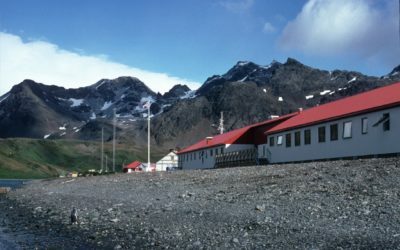 The opening of the purpose-built laboratory and accommodation facilities, which coincided with the withdrawal of the small British garrison from South Georgia, marked the return of biological research to King Edward Point after an absence of nearly 20 years. Originally biology, meteorology, geophysics and glaciology.  Since 2001, primarily commissioned research on sustainable fisheries and support for an administrative presence on the island on behalf of the South Georgia and South Sandwich Islands Government. FIDS/BAS occupied buildings of the Falkland Islands Dependencies Government administrative settlement on King Edward Point, across the bay from the whaling station at Grytviken (operated by Compañia Argentina de Pesca, 1909-1960). Discovery House was built for the Discovery Expedition in 1924/25. It was used for accommodation but later became a store and workshop. Shackleton House (demolished 2001/02 season) was built 1962/63 as a hospital and for accommodation. It was named after Sir Ernest Shackleton, the explorer who made the first major trek across South Georgia in 1915 and who was buried there in 1922. Other buildings used included the Customs House (demolished 2000/01 season), Coleman’s, the former residence of the last government administrator D J Coleman (burnt down during UK military occupation), and Quigley’s, the former residence of the last engineer on the government staff, J Quigley (later the medical facility). During the 2000/01 season four new buildings were erected. 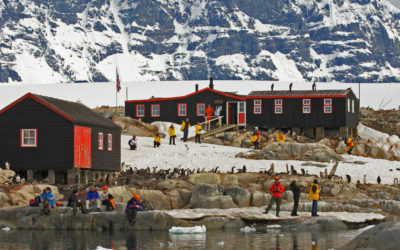 The biological laboratory was named the James Cook Laboratory after Captain James Cook, RN, discoverer of South Georgia and pioneer of Antarctic exploration. A new accommodation building, Everson House, was named in honour of Inigo Everson, BAS marine biologist 1964-2002. A self-contained apartment, named Shackleton Villa, attached to Everson House was provided for the Government Marine Officer and is now used for additional Government accommodation. The other buildings were a food store and generator/boat shed. Larsen House, named after Captain Carl A Larsen, Norwegian whaler and explorer, provides additional accommodation during the summer months. It was built in 1992 and substantially upgraded 2001/02. In 2006 a new building was erected for the Government Officer, and named Carse House after Duncan Carse, who led the South Georgia Surveys of the 1950s. A limited amount of science was resumed in 1986. The abandoned whaling station at Husvik was used as a summer field station from 1986/87-1988/89 and 1990/91-1995/96. Field huts have existed at one time or another at the following sites: Sörling Valley, Elsehul, Schlieper Bay, Hound Bay, Dartmouth Point, Glacier Col, Maiviken, St Andrews Bay, Hope Point, Coral Bay, Gull Lake, Carlita Bay, Royal Bay, Hodges Glacier, Jason Harbour, Ocean Harbour, Prince Olav Harbour, Lyell Glacier, Bay of Isles and Godthul. The abandoned whaling stations at Leith Harbour and Stromness have also been used. Many derelict huts removed 2005/06 season.